I bought this denim jacket from the op shop a couple of months ago. It is by Aussie designer 'Bliss'. I liked the shape and detail on the jacket, but wasn't so keen on the frayed neckline and cuffs. I also prefer full length sleeves, rather than elbow length, on a jacket as I really feel the cold in winter. This was a very quick fix. The frayed edges were just cut off with scissors close to the seam. Then, I lengthened the sleeves using thick, navy blue knit fabric. For the sleeves I began with this shape, the top is the right length to attach to the existing cuff, plus seam allowance. Then it tapers down to form the new wrist cuff. Sew left and right sides together. Place on jacket sleeve matching seams and placing the long edge to the existing cuff. Finish off the new cuff with a neat hem. Nice and warm now. Worn here with my ombre dyed Vogue skirt. If you haven't worn something for a while, have another look at it and see if you can update it with a quick fix. 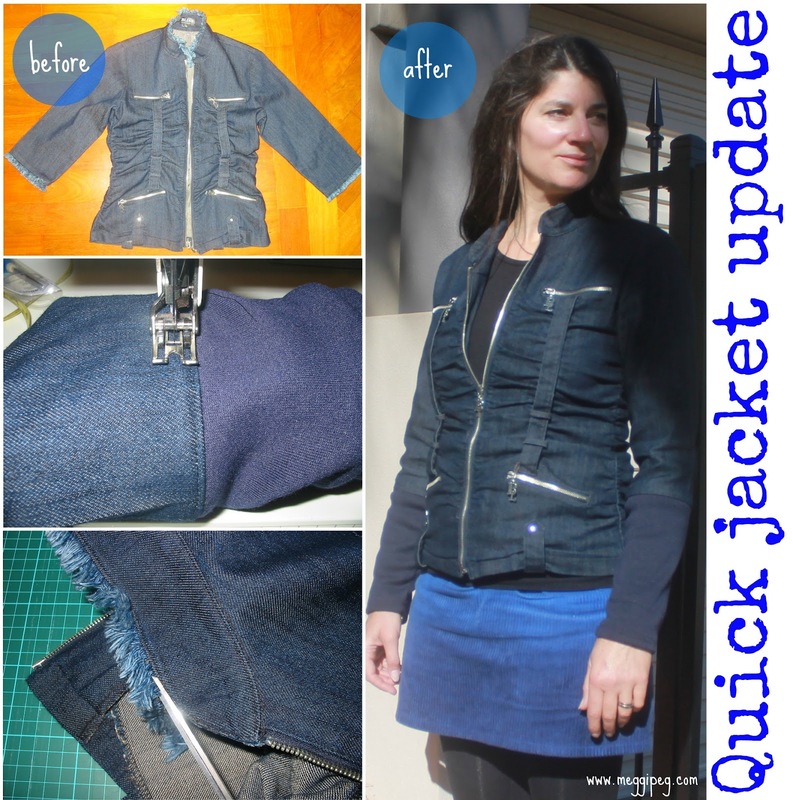 You can see some of my other Quick Fixes here. The longer sleeves will be much better for the mornings we have been having lately... hasn't it been cold!?! It sure has. I can't wait for some warmer weather. I always sew more in the summer too. My sewing room is too cold at the moment to embark on anything too ambitious! Short sleeved jackets have to be the most useless item of clothing. If I am cold, I want my hole arm covered. Great upcycle! I agree! Although shorter sleeved jackets can look gorgeous, it's all about practicality for me when it comes to staying warm. Sometimes you just have to sacrifice looking fabulous!! I agree with you wholeheartedly about the shorter sleeved jackets- they are so useless! Honestly, if I'm wearing a jacket it is because I want to be warmer, and that includes my wrists! Haha. Anyway, I like your update on your jacket, especially because it got rid of the frayed detailing. Did you need to sew anything on the collar to make sure the fabric doesn't re-fray or unravel after trimming it? How would you take a jean jacket that a little to tight and make it fit better?